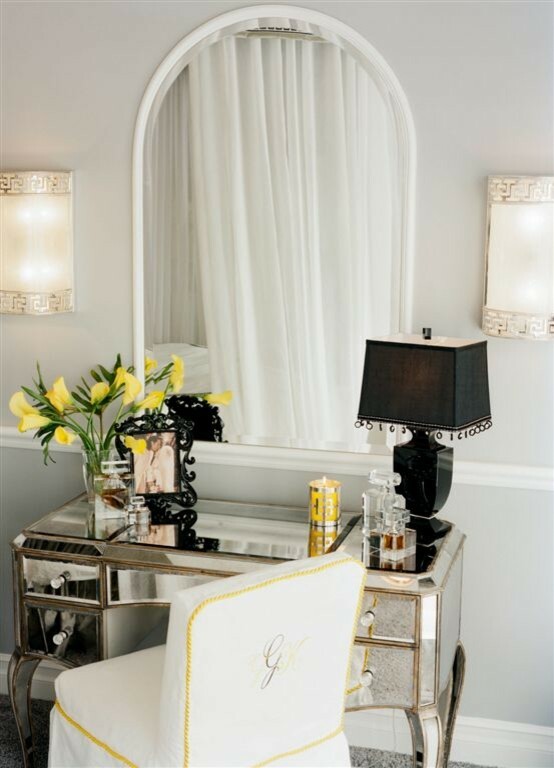 Fancy your private room like your bedroom with these fabulous makeup vanity table ideas. With these stylish collections, you can put your jewelries, mascaras, lipsticks, and many other makeup collections tidily. Many options of built-in mirrors added to these collections, you just need to select one that suits your personal style. What a fantastic it is! A craftsmanship makeup vanity table with marble top. The vanity features the outlets designed for the hair appliances and adjustable mirror (particularly flip-up mirror). 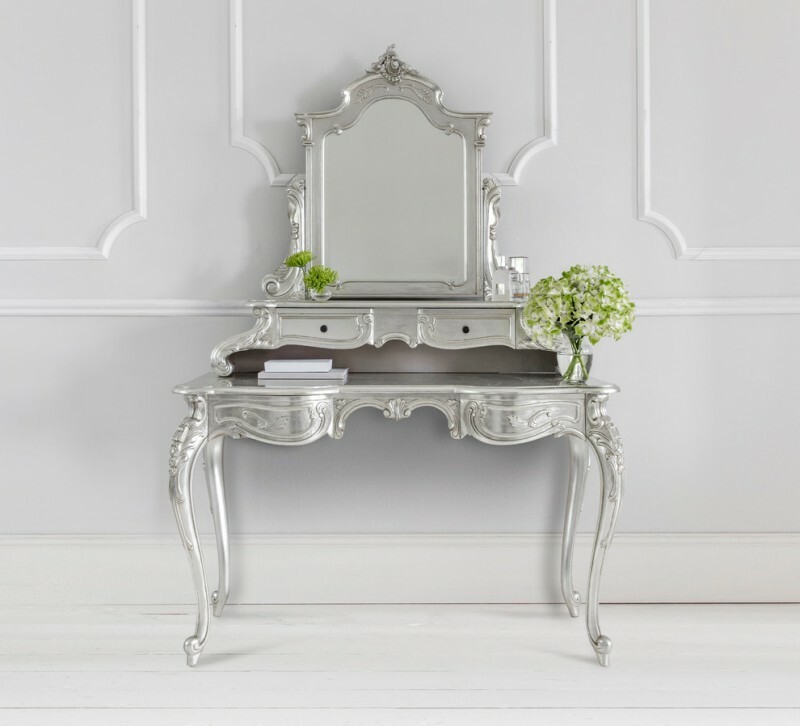 Fabulous makeup vanity in silver. It features four units of ‘magic’ drawers and adjustable mirror. 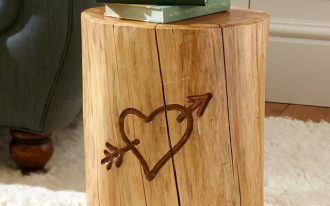 Cabriole legs and handmade carve details elegantly beautify the table. And all is in metallic finishing. This is a truly glamorous French style makeup vanity table! Antique and chic – a stunning French style makeup vanity idea with built-in round mirror, half-curved table, and cabriole legs. 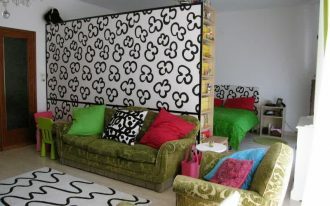 The color is really awesome when being combined with other soft-toned wallpaper. Soft-feel but still stunning, right? 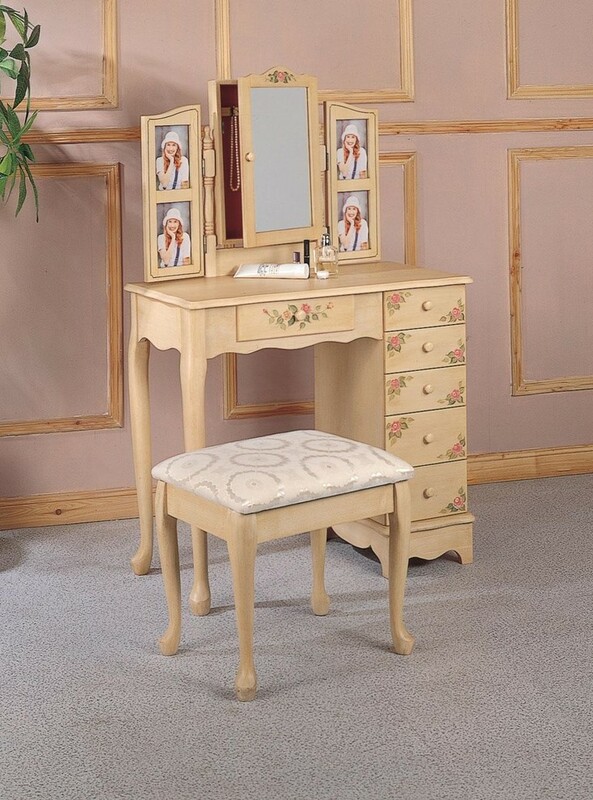 Just add a similar style vanity chair to improve your shabby chic makeup vanity. 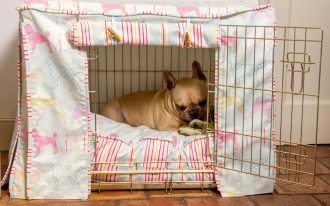 Soft-toned window curtains probably can make your room private room more dramatic. Fill the space with other soft tones like soft grey for floors and wallpapers. Fancy yourself by having such antique dressing table. The table has been a round-shaped mirror which is trimmed with shabby white frame. There is single drawer for a storage solution. The legs, furthermore, has cabriole model (with amazing artistic curve details). There are two options for the seats: a side chair and chair which are designed in antique French style. Which one do you prefer? What a marvelous it is! 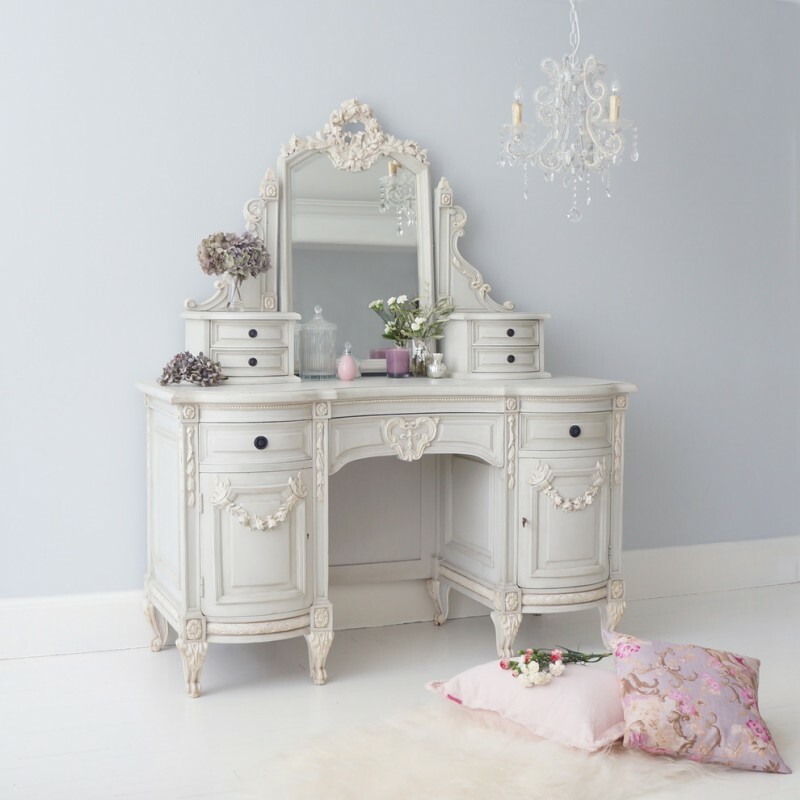 A French style makeup vanity furniture in pure white. To make it standing out, put any antique French furniture to create a glamorous private room. Don’t forget the vase with blossoming flowers! 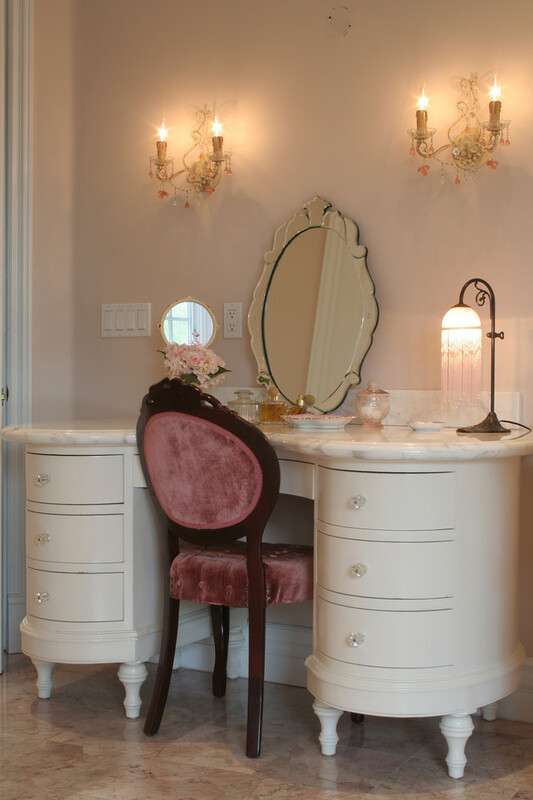 It’s a great idea to put your antique makeup vanity in your favorite space like this one. At glance, with shining background, the vanity stands gracefully among the luxurious curtains. That’s so beautiful. It seems like in one of fancy palace’s corners. This is one of most gorgeous collections today. 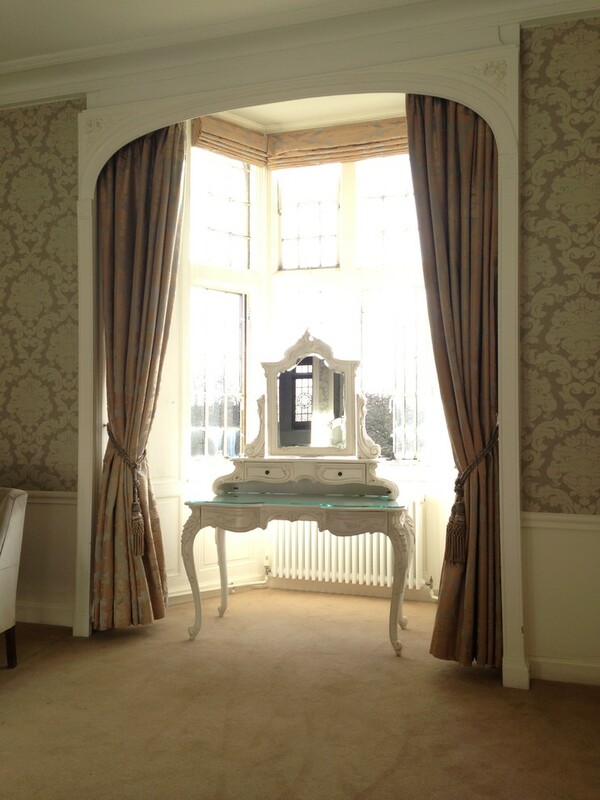 With shabby chic, the vanity has been completed with the signature hand carving-arts over pale base tone. Two couples of small drawers put in each side of built-in mirror. Larger drawers and a concealed central drawer are also inserted under the table. 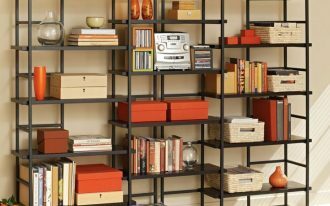 And, a pair of base lockable storage units is included for an extra storage space. Totally, there are 9 units of storage units in this vanity. This collection is quite beautiful. 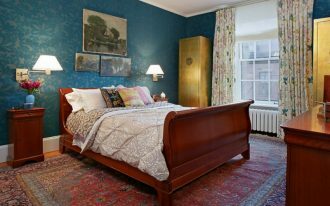 The design simply emphasizes antique and glamorous look as the main point. Based on physical performance, the vanity table has little space for storage (which is just represented by a single central drawer). Glass top surface the table, providing easy-clean and stylish performance, especially when it’s used for putting the ornaments or makeup items. The dressing table is quite unique, but the chair is more quite unique! It’s built from best quality solid acrylic. It’s evidently durable and strong. The design is simply minimalist and modern. It can be said, both the vanity table and chair are a real representation of two different styles: antique French and modern. 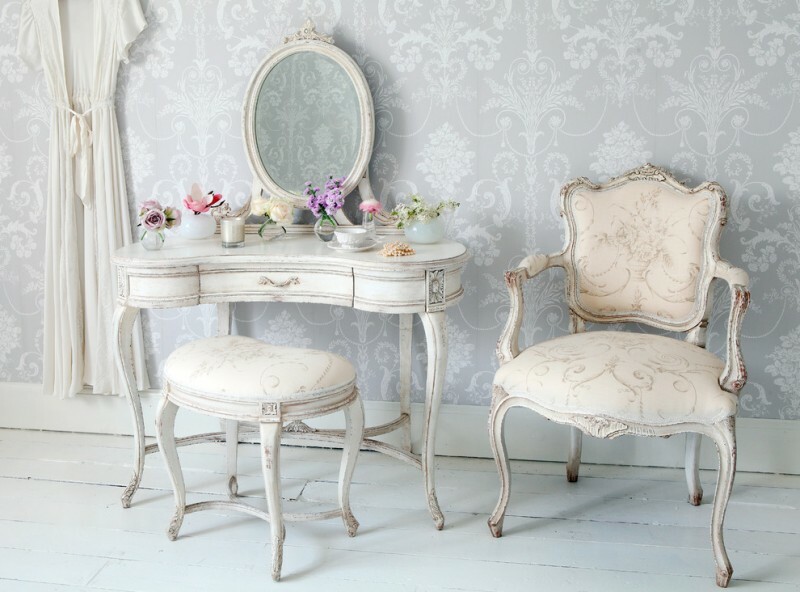 This is another glamorous and antique dressing table collection. Gold finishing wholly covers the furniture. Attractively, it has three units of round mirrors which are beautifully trimmed by best hand-carved frames. The mirrors’ base is gold-finished rattan details which are designed in classic. Unfortunately, this furniture has no storage solution. 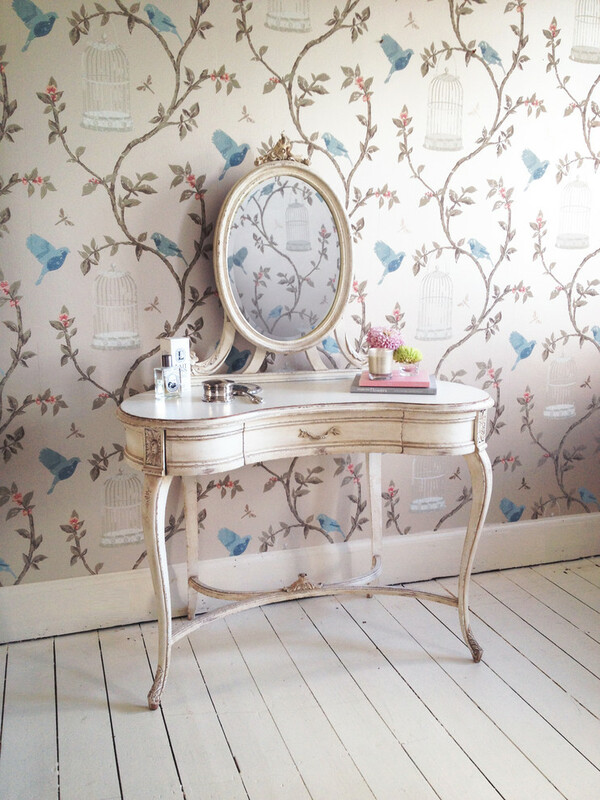 Build your own dressing table by adapting this idea. Just mount a mirror on your wall and install a simple board as the table in such a recessed space. 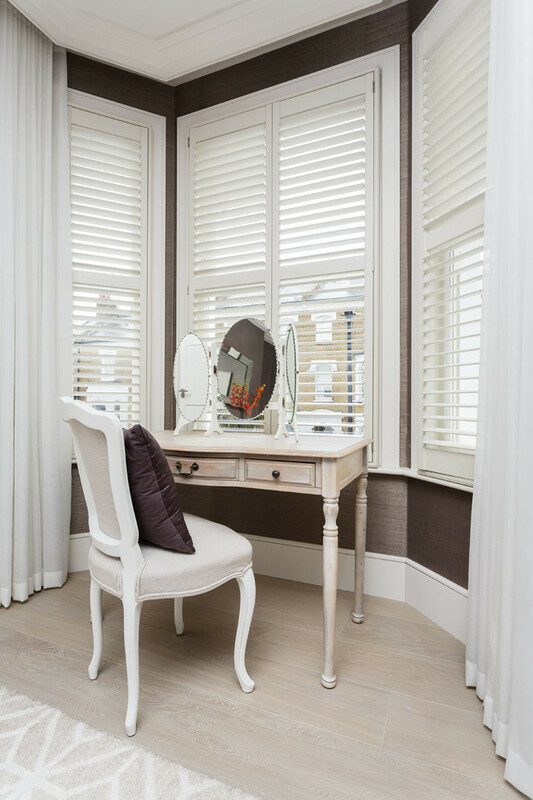 This corner is multi-use, one of its uses is as a stylish and simple dressing table. Another idea of simple makeup vanity table with separated mirror. Wall-mounted mirror has unique and asymmetric shape and it’s framed by light grey metallic frame, a similar scheme to the walls and curtains. The vanity table is simply designed in modern style and merely has a pair of drawers for storage space. Probably you may add a classic or modern vanity chair; it’s free to add any styles for chair. 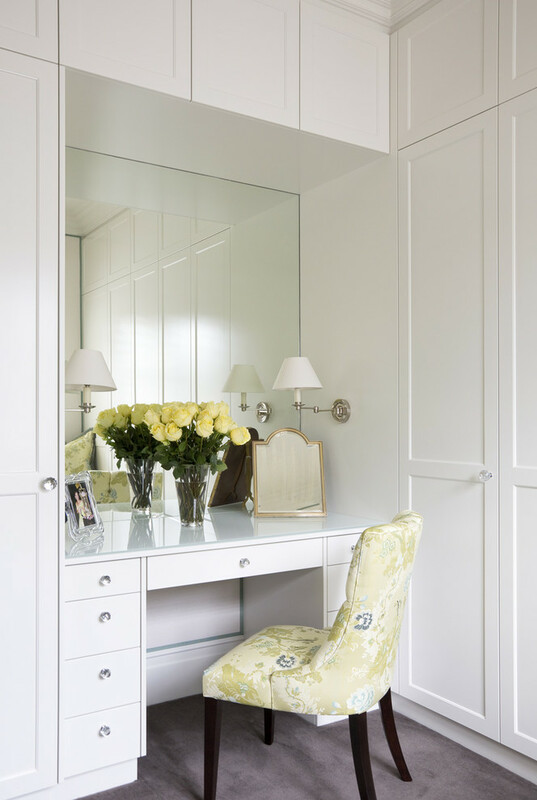 A white and classic dressing table idea with thick and round-framed mirror separated from the main unit. Look at the ‘mini tree’! it’s unique item for your jewelry collections. Solid acrylic vanity chair is also recommended for such product. Yes, it’s too crowded and make dizzy. If you love monochrome scheme, this idea probably matches your style. 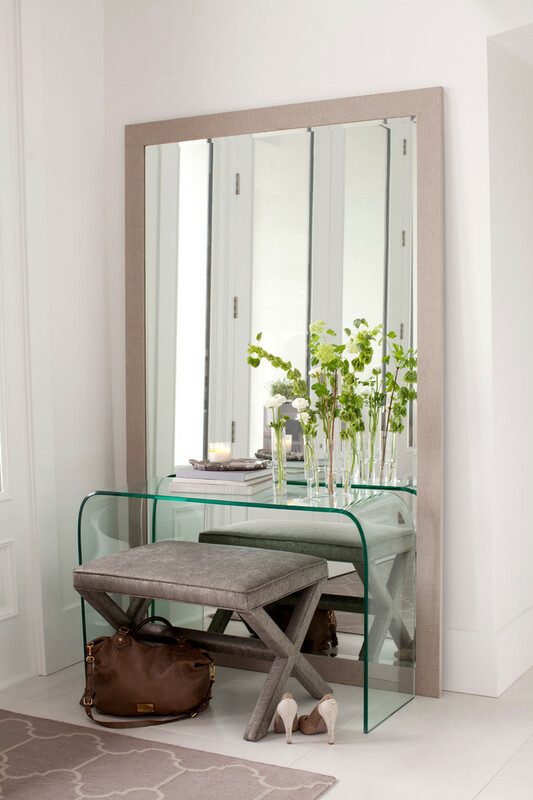 Transparent & solid acrylic vanity chair and mirrored vanity table will obviously help walls stand out. An ornate makeup vanity table for a living room. It’s a great idea to furnish your living room with secondary furniture like a stylish makeup vanity table. Mirrored vanity table with separated mirror create uniqueness. 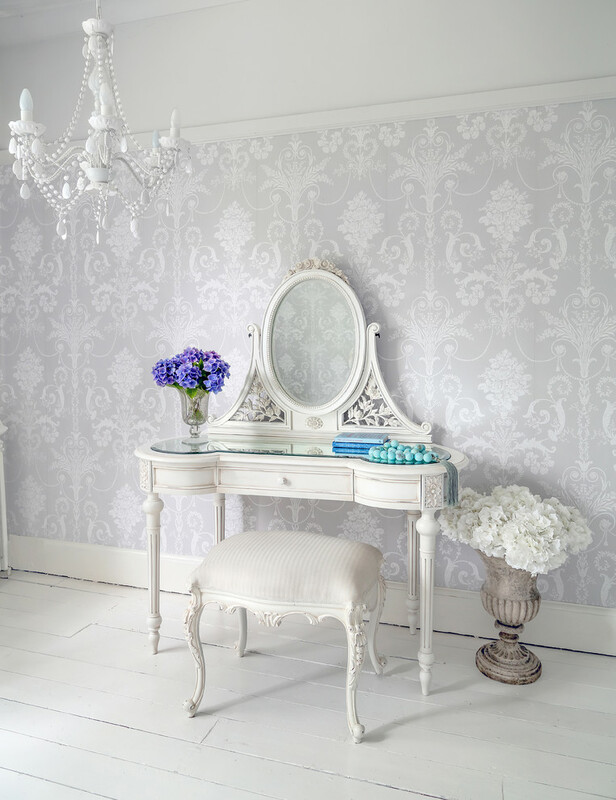 Reflected visual of wallpapers are clearly viewed on mirrored vanity, bringing more ‘crowds’ in this room. 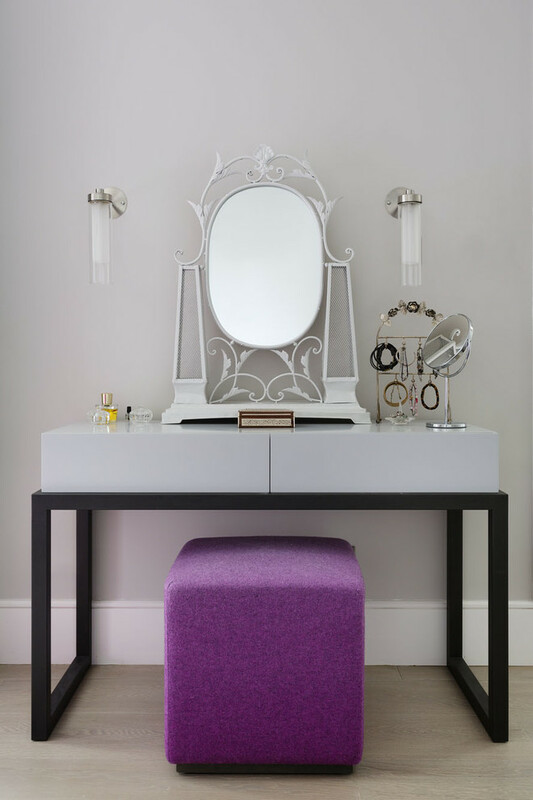 By contrast, a solid and transparent acrylic vanity chair reduces the visual effect of crowds resulted by the wallpapers and their reflected visuals. Black here is a direct interest and it brings a vivid tone among pure white interior. Lots of colors such as ornamental flowers and other accessories here are intentionally put for more beautiful looks that can be visually reflected by this mirrored makeup vanity table. The output is really amazing, right? Smaller and simpler makeup vanity table with lots of wall decors. The mirror and wall decors are framed in gold finish, creating an elegant and expensive look. In contrary, the vanity table and chairs are dominantly covered in light grey, producing the sense of cool and mute feels. 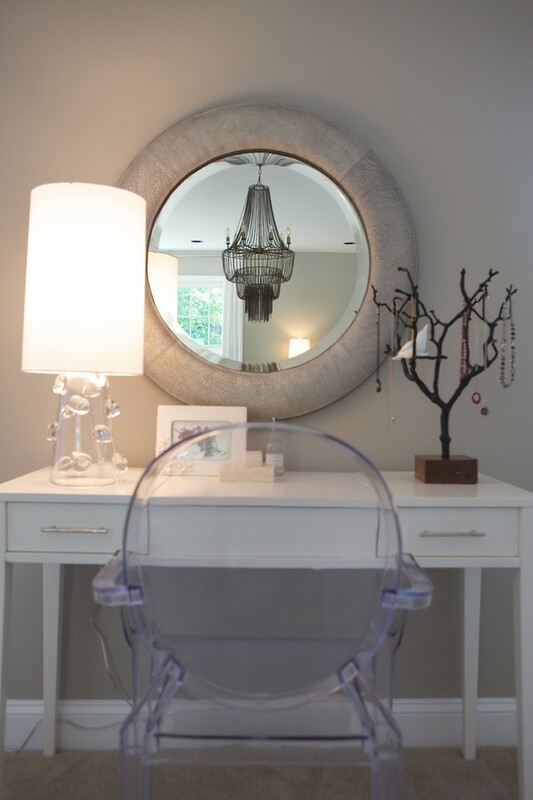 Furnish your guest room with such amazing dressing table and chair. The furniture is truly classic and luxurious. Some of them are designed in custom, so you can make a new one based on your favorite style. A mix idea of classic and modern. Just little parts of furniture use classic or traditional style. 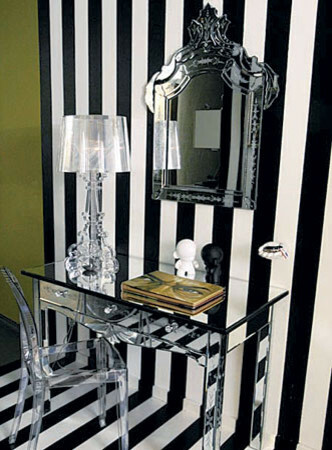 The legs of mirrored vanity, for instance, use semi-curly shape which is usually discovered on the traditional style. By contrast, the clean lines and simple design here truly show modernity. Perhaps, this is an ordinary table but then the owner transforms it into a dressing table. She just adds a medium-sized frameless mirror and fills it with a lot of jewelry collections. Put some artistic items as the ornaments. The design emphasizes the clean lines look but it still exposes the details of antique values discovered on drawers and legs. Here, you’ll also find a minor mirror which acts like a decorative as well as functional item. The space is truly opulent with using bright purple. 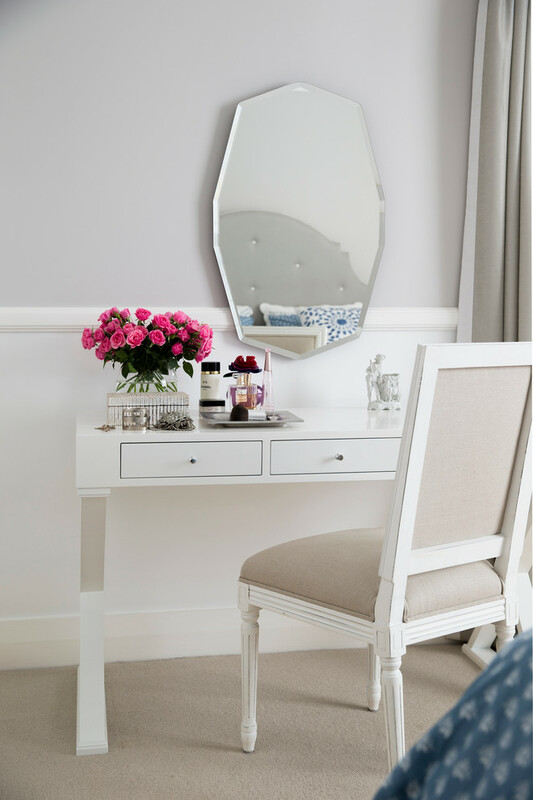 All furniture sets, including the dressing table, make this room quite feminine. With a simple round vanity mirror, the lights can bounce back to the whole room, an instant way to get an airy and lighted space. Please notice the vanity table; it has regular and unique texture. The legs is also unique, all legs are pointed metallic finishings. The mirror, additionally, looks like a flat TV. This means all components are distinctively unique. 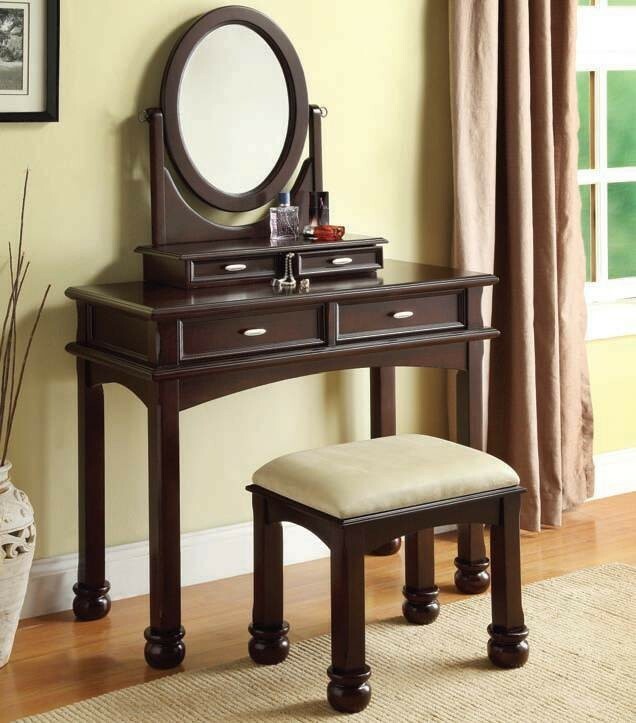 X-base makeup vanity table in white. The table consists of three units of drawers and separated frameless mirror. The vanity chair is in beige and trimmed by white-finish frames. Actually, this isn’t a dressing table or makeup vanity, but just a wood bedside table plus vertical mirror with gold frame. You can use it as an alternative of makeup vanity by adding a chair. Simple but quite useful, right? This is so classic and full of hand-carving details. The table is made of wood without finishing and the mirror uses black wrought iron frames with beautiful carvings. All details are highest artworks. A cottage style makeup vanity idea. The mirror is smaller and convertible. 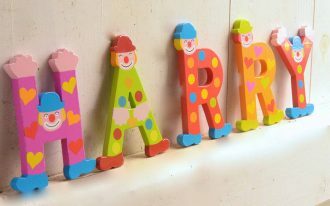 Some picture frames are included as the ornaments, and the flower prints here beautify the central drawer and drawer system. A signature collection of dressing table with marble top and frameless mirror. The vanity is garnished with curved lines and huge space of storage. On right, there is a fabulous table lamp with stream-down effect lights, and a couple of wall lamps beautifully illuminates the vanity’s area. Dark-toned wood dressing table features layered drawer system and round mirror. It’s effective and space-efficient. Magenta and black are sweet to combine. Here, magenta dominants the table but grey decorative lines accent it. 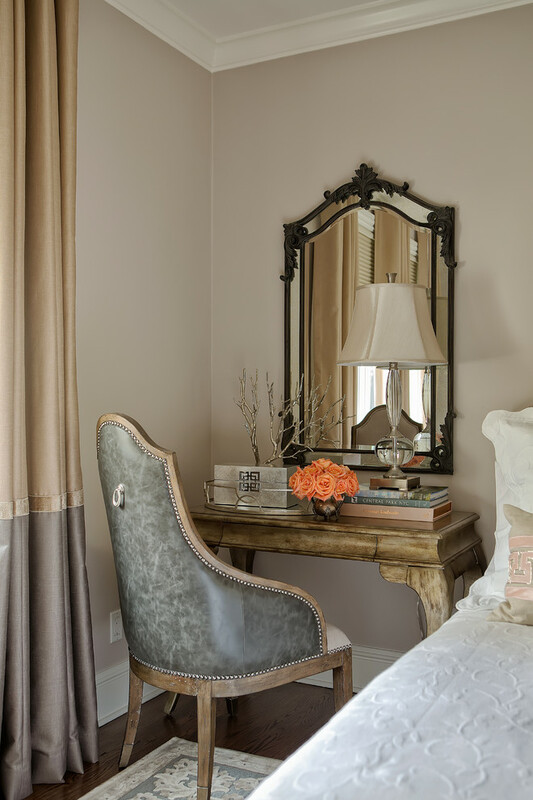 A couple of table lamps and wall-mounted mirror add the elegance. 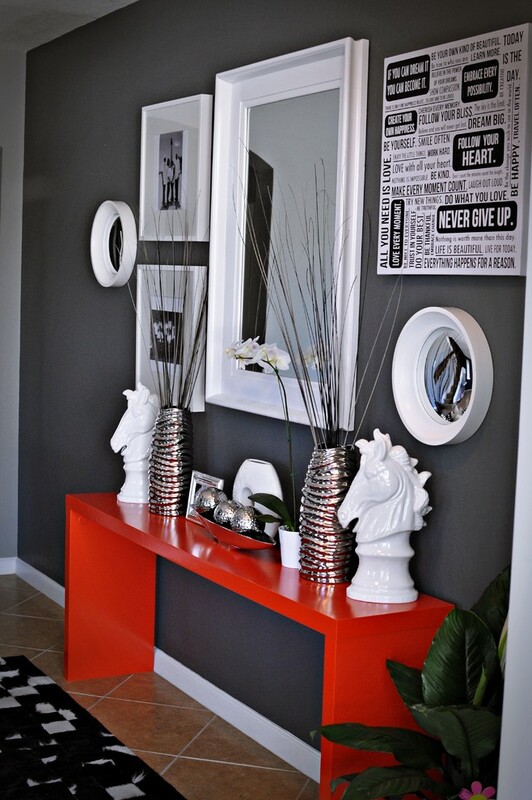 If you love such color combination, you need to try this idea. 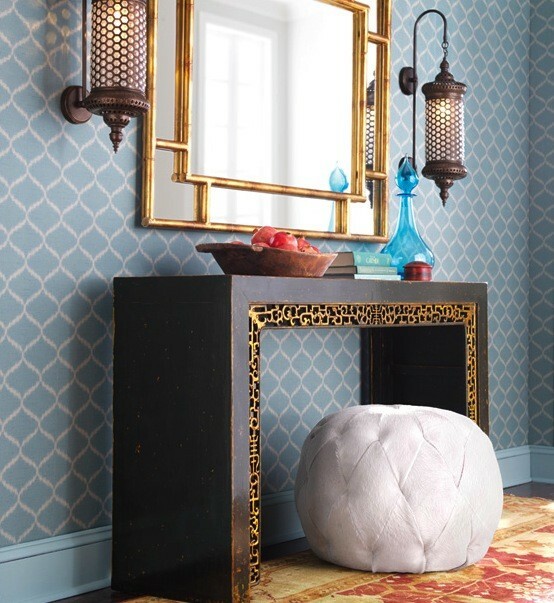 A decorative powder room placed in an entryway evokes modern and stylish. Here, the owner selects pure white and bright red as the primary colors, and the colors application creates a striking look. This powder room is furnished with some series of antique and unique items. Antique table has the gilt carvings as the accents, and a hairhide ottoman chair truly blends with the table. Their color contrasts yet complements each other. 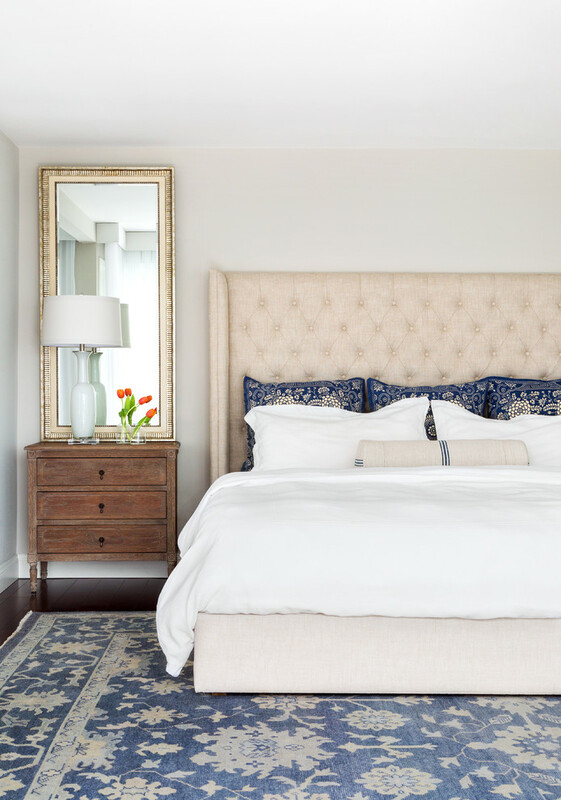 On walls, we’ve found a couple of amazing ‘arterior’ sconces inspired from Moroccan arts, and bamboo-paneled mirror becomes the complementary wall decor. 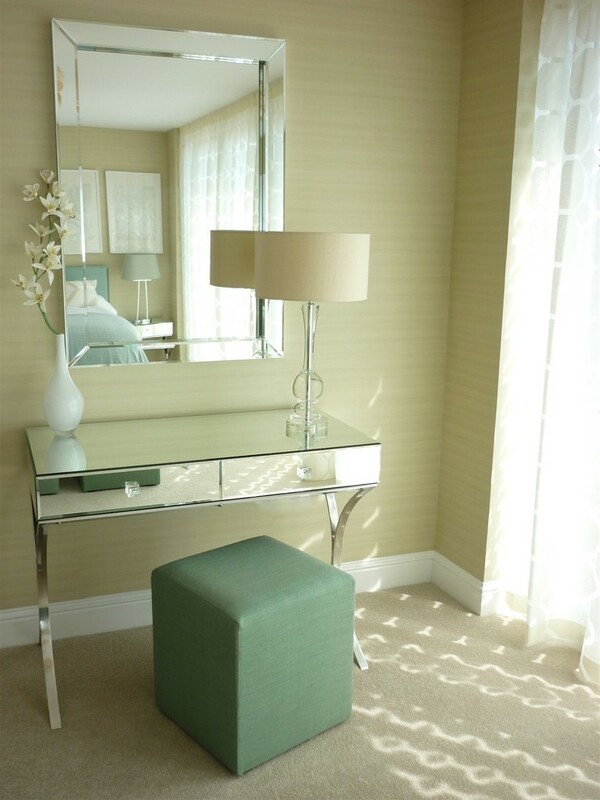 Transparent glass dressing table idea combined with pale wood-paneled mirror and x-base vanity bench. Full-length standing mirror is selected to help creating a visual effect of larger space. 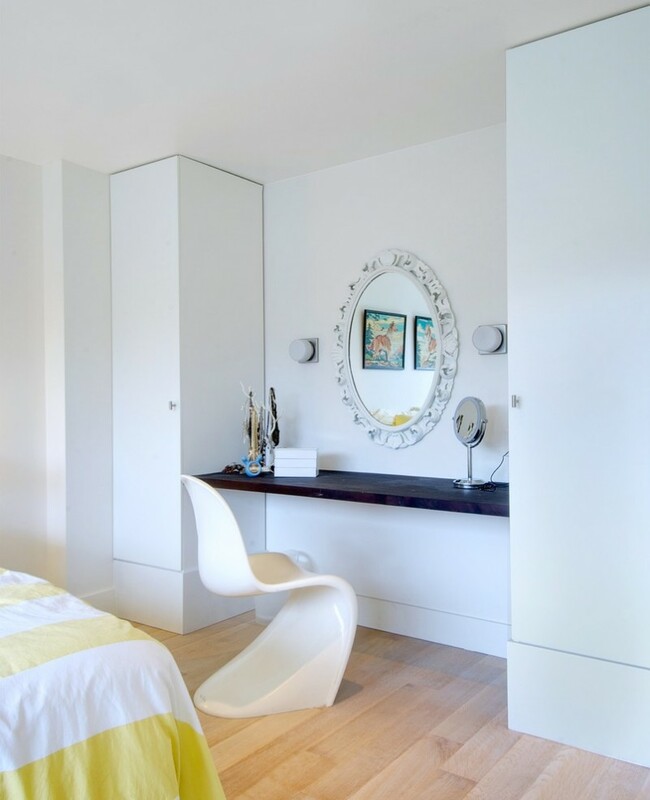 We all know that lots of mirror applications can make a space larger by its visual effect. A recessed makeup vanity table idea – The design is actually the extended version of walk-in closet where we can put all wardrobe collections. A vanity chair needs to add to provide a cozy seat, and it’s ok to put a low-lighted classic wall-lamp for a dramatic lighting effect. 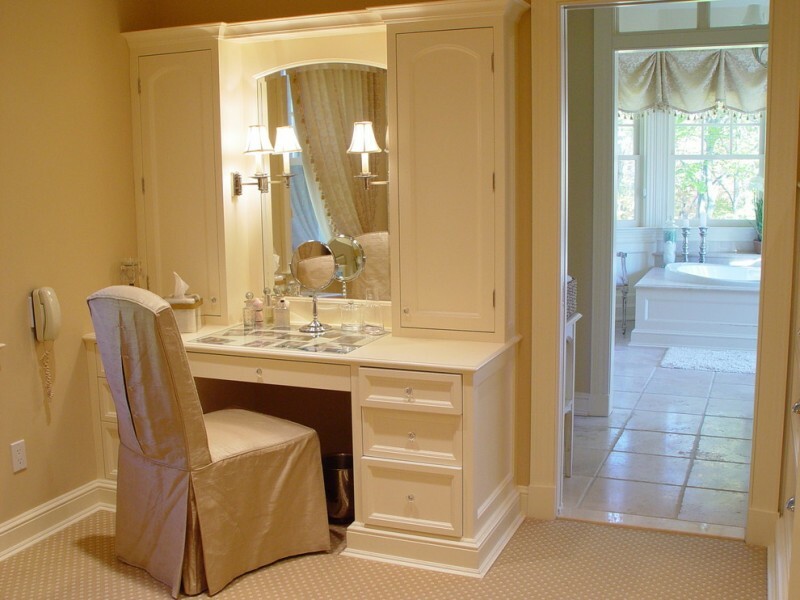 Makeup vanity idea with recessed and frameless mirror. Yellow vanity chair blends with the ornaments perfectly. 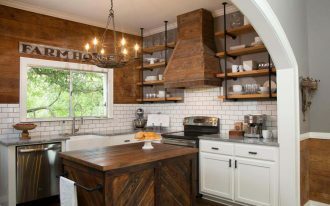 In this space, the owner just wants to apply two clean color tones which can bring airy look. This is an amazing makeup vanity design that displaying two opposite styles. The table is clearly minimalist and the mirror is seemly classic (recognized by its artistic metal carvings and frame’s shape). The idea is adaptable for you guys loving both styles. Just select the contrasting color tones for a clean line look. A contemporary dressing table with gloss veneer. Chrome finishing covered on legs add luxury, white vanity bench here also adds feminine elegance. 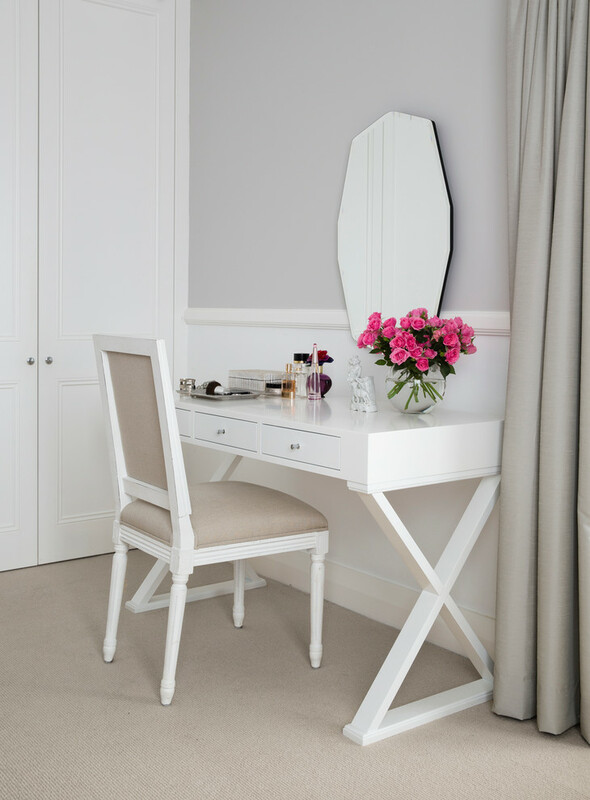 This is a perfect choice of dressing table for a modern interior. Wood furniture without finishing ultimately blends with clean lines bedroom. A creative makeup vanity idea consisting whitewashed table and three-sided vanity mirror. The table is actually a working table which is re-used as the vanity table. The chair and mirror choices are segmented to the traditional concept. 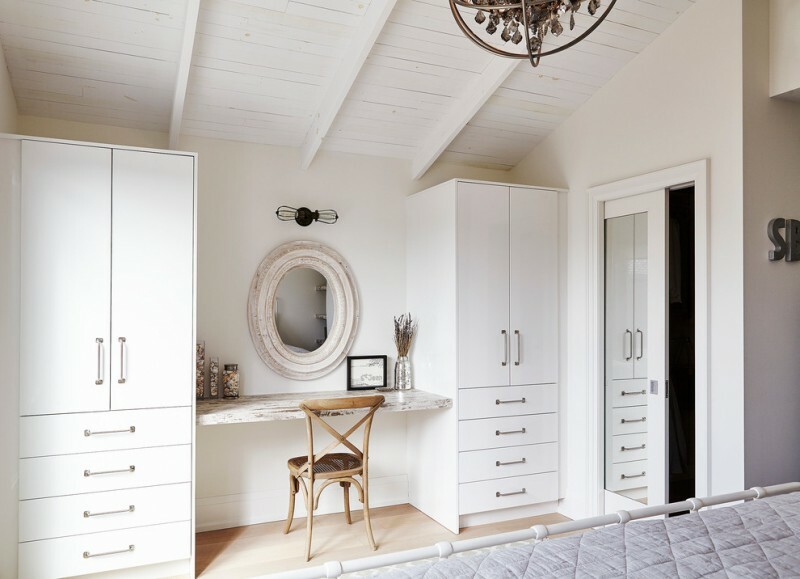 Wanna have a unique beach-style bedroom concept with a fabulous makeup vanity? Probably you must adapt this vanity idea. The vanity merely consists of a simple whitewashed board installed horizontally between the cupboards. 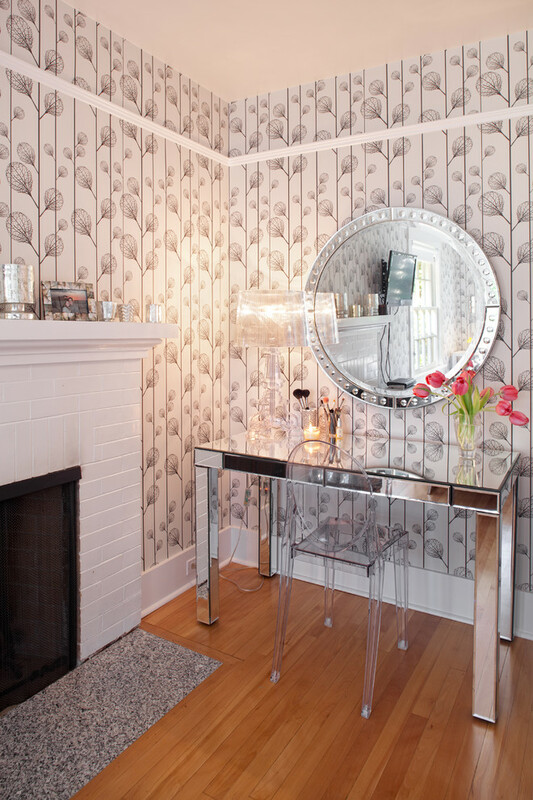 Mount a round-framed mirror on wall and add a central sconce over it. A simply stylish beach style vanity has done for you. A custom makeup vanity integrated with walk-in closet. The mirror is really unique. It has waving edges for the accents. The chair isn’t all white, wood panelings are found as the partial elements such as in backrest’s frame, legs, and armrests. Grey and white are contributing in creating the airy and clean feel. 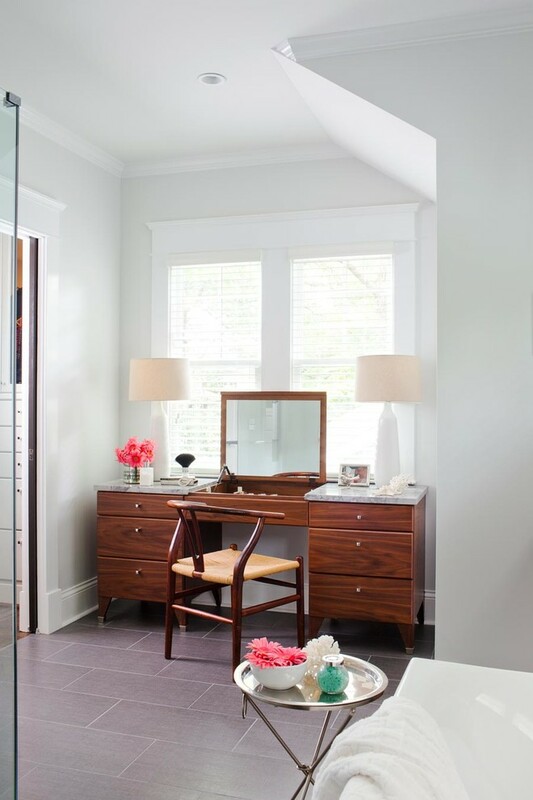 If you’re dreaming of an airy yet stylish powder room, this idea may be your best inspiration. White for the furniture and light grey for the interior are well-recommended. Dark wood (applied on chair’s legs) is just the color accent. 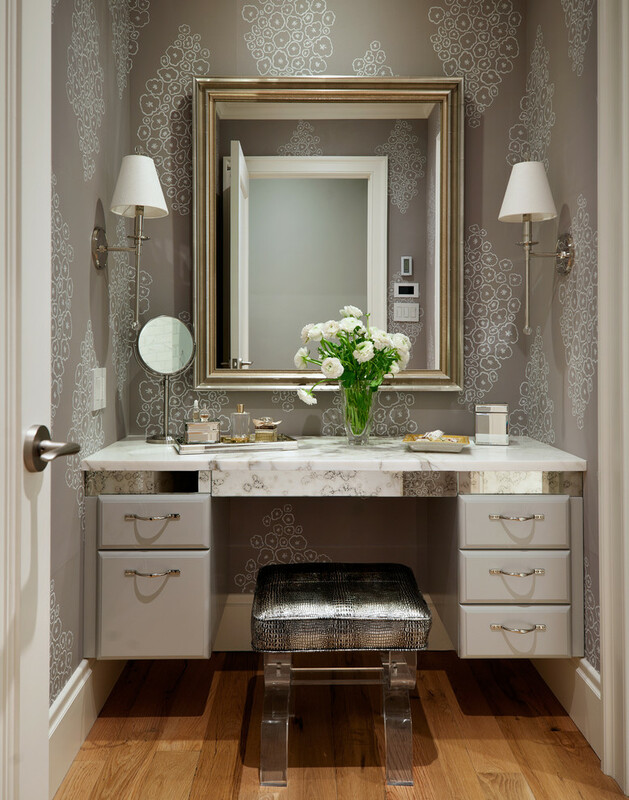 Beige wallpapers accented with simple yet beautiful motifs seem to be the best match for marble-top makeup vanity table. They aren’t contrasting but balance each other. Front-panel and drawers’ handles are all metal (especially chrome), as luxurious as the mirror’s frame. The point is the overall design is truly expensive and elegant. Quite simple and minimalist, this makeup vanity just includes small-sized table (with pull-out drawer) and chrome-framed mirror as its complementary element. 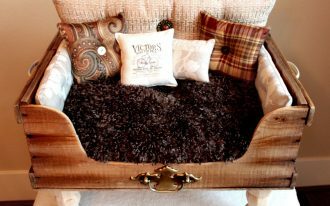 Slim & black chair is intentionally added for providing a cozy seat when starting to touch up. 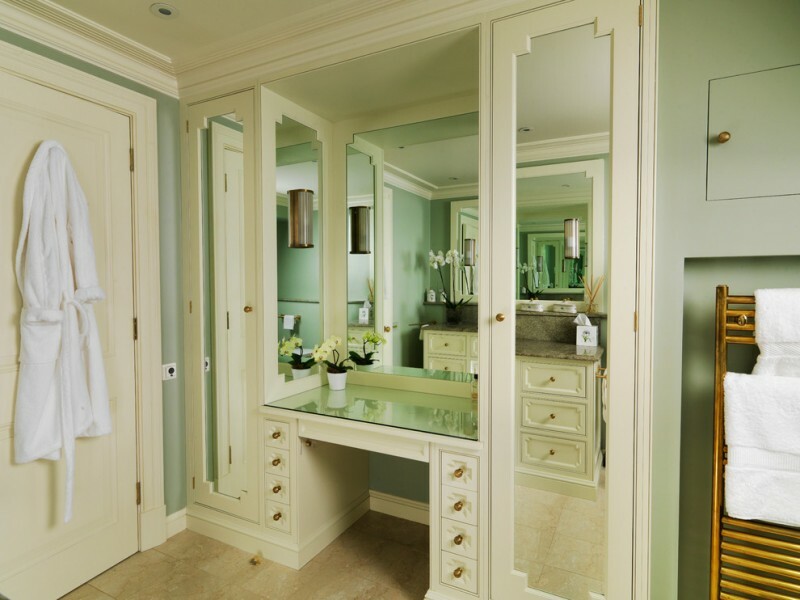 Notice the size, this type of makeup vanity is quite suggested for a small powder room. Wood-top makeup vanity conveys the natural value among white-finishing use. It also wants to expose the output of genuine tree specimen as the direct interest in this dressing room. Keep being fresh on traditional and clean look. White is obviously dominating, giving airy, fresh, and elegant feelings. 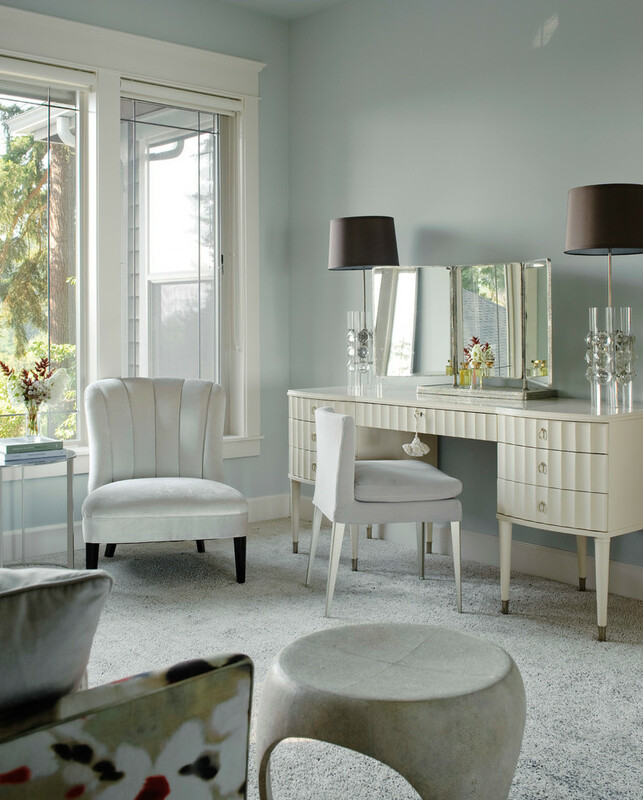 Accent it with another soft but clean color tones/ motifs like this vanity chair. A luxurious vanity idea with clear glass top and small-sized pull-out drawer system. The vanity integrates into a walk-in closet unit, offering more practical and efficient use, especially for making-up and dressing. This is an idea of formal makeup vanity table. Formal feel is powerfully felt by its design, seat, and storage option. Small-sized vanity lamp is uniquely designed in classic/ traditional style, and it results warm & low-lighted illumination. Formal yet romantic, isn’t it? This is a vintage makeup vanity table which has been re-painted to meet most recent trend in color. Beige walls become beautiful background and white finishing elegantly contrasts with the background and carpeted floor.